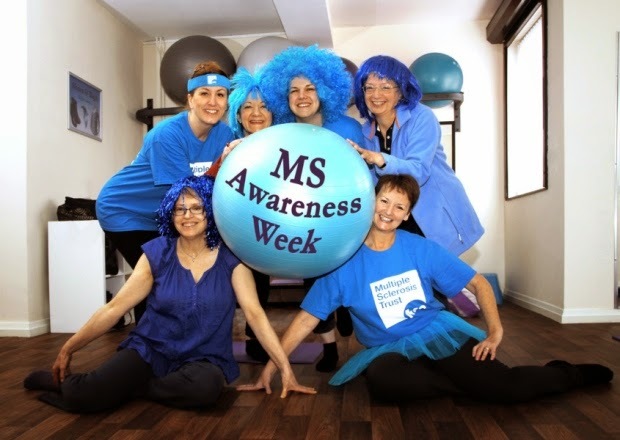 Pilates classes held in Retford have raised more £230 as part of the Be Bold in Blue Multiple Sclerosis Awareness Week. Retford-based Neurological Physiotherapist Jo Pritchard introduced a fun element to some serious exercise by asking her classes to dress up in blue as part of the national Multiple Sclerosis Trust campaign. “People with MS are not easy to identify in everyday life; they don’t look ill and they are not confined to a wheelchair,” said Jo. More than 100,000 people have been diagnosed with Multiple Sclerosis in the UK. It is a condition that affects the central nervous system can affect anyone at any age, though most cases are diagnosed when people are in their 20s and 30s. Common symptoms like fatigue, poor concentration and lack of balance can sometimes be mis-interpreted by people who simply aren’t aware of the facts, and this lack of understanding can sometimes lead to feelings of isolation for individuals with MS.
More information about the Bold in Blue awareness and fund-raising campaign can be found on the MS Trust website at www.mstrust.org.uk. Separate to the MS Trust, the MS Society has an active group in Retford that meet on a regular basis.